After migration, you try to login to Review Assistant server and get the “Invalid Credentials” error. This can happen because the path to SQLite database is missing or incorrectly specified in the server settings file and the data did not migrate or partially migrated from SQLite database to SQL Server database. 1. Make sure that the SQLite database exists (the default location is C:\ProgramData\Devart\Review Assistant\reviewassistant.db). 2. Open the server settings file (settings.xml) located in C:\ProgramData\Devart\Review Assistant\ and check whether the <Database> tag correctly specifies the path to the SQLite database. 3. Delete the ReviewAssistant database from SQL Server. 4. 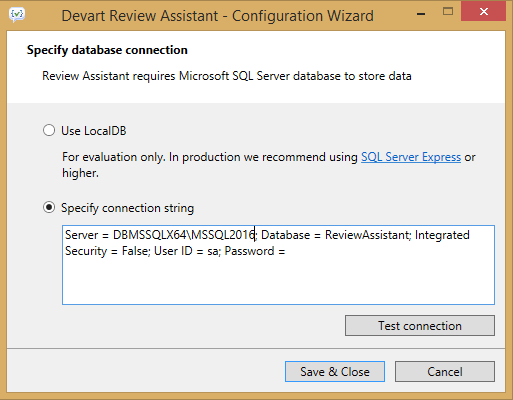 Create a new empty ReviewAssistant database on SQL Server. 5. Invoke the Configuration Wizard by running the ReviewAssistantServerConfig.exe file located in the installation destination folder (which is C:\Program Files\Devart\Review Assistant\ by default). 6. Specify the connection string to the SQL Server database created in step 5 and press Test connection. If the connection is successful, press Save & Close. After the last step, the data from the SQLite database will be migrated to the SQL Server database. You will be able to connect to the Review Assistant server from the Visual Studio client as you did before. A connection error can arise when you specified an incorrect connection string during the update. 3. Invoke the Configuration Wizard by running the ReviewAssistantServerConfig.exe file located in the installation destination folder (which is C:\Program Files\Devart\Review Assistant\ by default). 4. Specify the connection string to the SQL Server database you’ve created on SQL Server and press Test connection. If the connection is successful, press Save & Close. After that, the migration process should be executed successfully and you can connect to the Review Assistant server. There is a number of compatibility issues you may encounter during the migration. To migrate Review Assistant from LocalDB to SQL Server, make sure that the SQL Server version is higher than the LocalDB version. 1. Stop the Review Assistant server. 2. 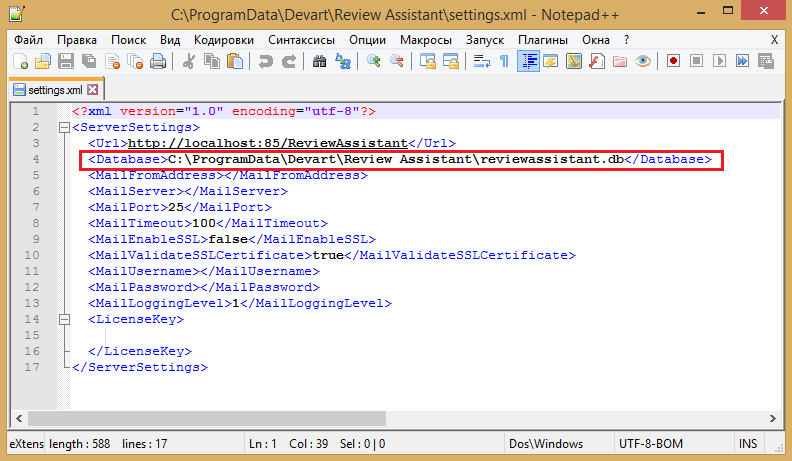 Copy the ReviewAssistant.mdf and ReviewAssistant_log.ldf files (by default, located in C:\ProgramData\Devart\Review Assistant) to a save location (just in case). 3. Attach the ReviewAssistant.mdf file to SQL Server. 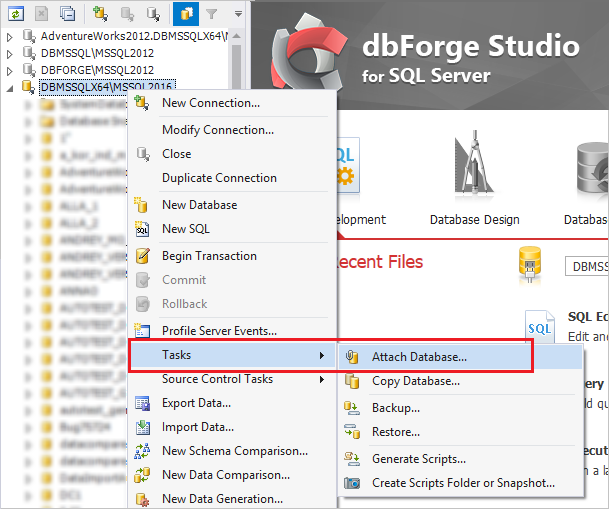 For this purpose, you can use MS SSMS or dbForge Studio for SQL Server. After the database file is attached, you can rename the database. 4. Invoke the Configuration Wizard by running the ReviewAssistantServerConfig.exe file located in the installation destination folder (which is C:\Program Files\Devart\Review Assistant\ by default). 5. Specify the connection string to the SQL Server database and press Test connection. If the connection is successful, press Save & Close. Please note that after the trial period expires, you can continue using LocalDB for storing the Review Assistant database. We hope you find this article helpful and informative. Feel free to leave your comments and ask related question here or at Review Assistant support area.